Am I the only one who has to sing nearly the entire ABCs to figure out ABC Order sometimes? No, just me? For some reason, a lot of those letters are jumbled up in my brain. Especially j-n. I have to sing it every time for those letters. I’m not sure if practice would help but I’m hoping my kids will be a bit better at ABC Order than I am! 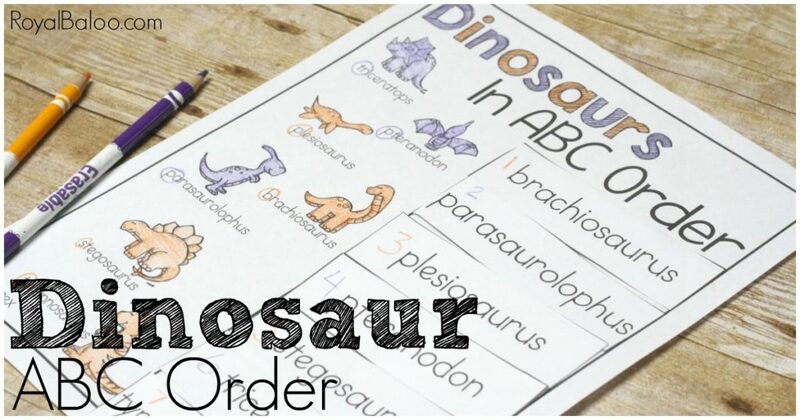 Activities like the Dinosaur ABC Order will help (fingers crossed). If you like printables like this and want them as soon as they are available, I highly recommend signing up for the newsletter! This free printable went out to the newsletter about 3 weeks ago! All in all, ABC Order isn’t one of those skills that people can’t live without. It’s obviously useful for filing and in libraries but there aren’t a lot of applications for ABC Order. Still, when you need it, it’s helpful to know it! I find that kids don’t always care about order and organization but when you present dinosaurs, they’re excited. I know my kids are excited over almost anything that has to do with dinosaurs. This is really a no prep set so set up isn’t required! I just printed and handed it over! They can cut out the words on their own! As for use, I explained ABC Order in reference to the library system. It’s a way we organize some material like books (by first letter of the author’s last name), indexes in the back, and so forth. To be honest, they really didn’t care. We rarely look up books by author (but they’re pretty good with the Dewey Decimal System). So we went to the big dinosaur book and looked in the index. How can we find out where information on velociraptors would be located? Turns out, we can turn right to the ‘v’ page and find out! This freebie is part of the newsletter system. Quick sign up and the link will show up in your inbox!